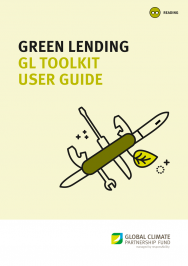 The Green Lending (GL) Toolkit supports financial institutions to strategize, plan, and deploy green lending best practices with the overall goal to expand the GL portfolio. The Toolkit contains a practical set of information guides, strategies, training courses, best practice templates and links to resources. It has been designed to serve banks and financial institutions, both at the start of their green lending efforts, as well as during growth and expansion of green lending throughout the organization. The Toolkit is modular and institutions can choose the tools that are relevant to their current needs. The most successful green lending programs have undergone a deliberate strategic planning process. This module informs how to develop a Green lending Strategy & Plan. Real examples of GCPF financed projects showing how energy efficiency save money or how renewable energy projects generate value. Check out the Green Lending Conversations! To develop a green lending strategy and plan, your company’s leadership and management staff need to agree and align on how to drive performance with green lending. This module provides training materials for a two day workshop that will be facilitated by an experienced, independent moderator upon request. To capture the full potential for investing in energy efficiency or renewable energy, credit officers need to be equipped to identify clients having such interest. This module contains diverse materials for a facilitated workshop enabling your institution to explore this potential in your market. Building a green portfolio is best achieved if within you institution a number of “champions” are trained as trainers to understand how to engage and motivate staff and deliver the activity based trainings in the Toolkit. A two day facilitated workshop equips your champions to build capacity across your institution.